Its been three long weeks since Ada has seen Madame. When the opportunity arises for her to go Madame's room for a chore she jumps at the chance. Unfortunately, Madame isn't there, but Ada can hear her soft moans and pants not far away. Ada investigates and finds the door cracked open to Monsieur's chambers, where she spies Madame on the bed with Monsieur. As if possessed, Ada can't look away. She watches them together. After they both reach their own release, Ada tries to finish her job and leave before being caught looking in on her employers, but she is caught by Madame, in the most pleasant way. Before she knows it, Ada and Madame are kissing, enjoying each other's bodies. 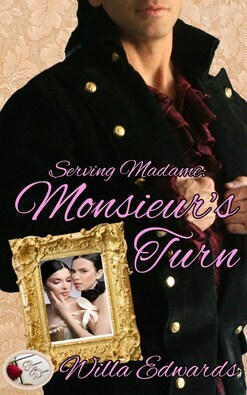 It all seems amazing, fantastic, all Ada had dreamed of, until Monsieur enters the room, demanding his turn.